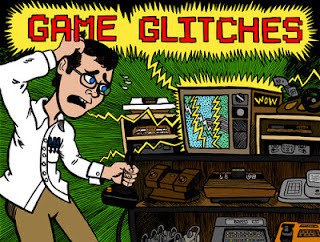 I have played a lot of video games throughout the course of my life and honestly I can't recall that many games with such noticeable glitches and/or bugs as I can today…now I'm not saying there wasn't any (so put away your can of whoopass and holster those light guns)…just that they were few and far between and for the most part they didn’t hinder the overall experience. Before the idea of having a constant internet connection came along, which allowed developers a direct link to your system; it seemed as if they kept the games on the burner until they were completely done or at least as close as possible. Now though, it seems as if they release games before they should…with the thought they'll just patch up any issues later. This philosophy may work well for the publishers but unfortunately it leaves the games with a bad taste in their mouth. Obviously not all games with glitches/bugs fall into this category, there are some that just slip by the quality testing peeps and unintentionally make it to the sales floor. However, there are some that seem as if they just get thrown out with the idea that they will just be fixed later at the gamers expense. Bethesda’s games are a great example of this…I would recommend to anyone playing one of their games to save…and to save a lot…because there is nothing more frustrating than being in the middle of a game and running into one of those said glitches/bugs and having to restart everything you just did…talk about nerd rage. There also doesn't seem to be a sense of urgency on the developers part to release the patches to fix the said issues at hand either…sometimes it takes weeks, months or even in some extreme cases years. I don't know if they're not aware of these issues until it's pointed out…or if for our $60 we're buying a beta which we are the testers for…to make the games more enjoyable for those people who’ve decided to wait on picking it up when it’s first released and just buy it later on down the road…who knows…I guess like Guns N' Roses said, “All we need is just a little patience”. I know with the advancement of technology and of course the margin of error for the human involvement, it's not an easy task to make a perfectly polished game. However, I don't think it's asking too much that a $60 game be playable from the moment you take the shrink wrap off either. Very true! 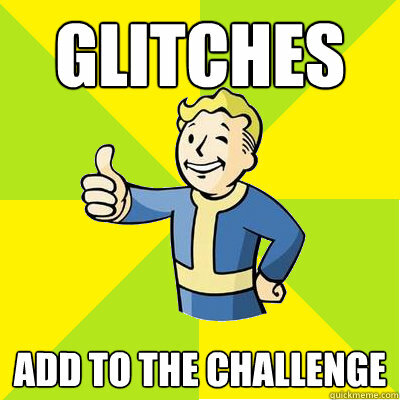 I had many glitches when I bought Skyrim a couple years back and I paid $60 for it! I know what you mean...I too did the same thing...and if it wasn't for my strong love for Skyrim I would have thrown the disk in the garbage.